Being confined is terrifying to me, being confined within my own body because of something like sleep paralysis is frightening beyond measure. This piece, Paralysis, was hard for me to conceptualize, shoot and process; it was an all around challenge, but it was the second of two image ideas that would evolve into this series Things That Go Bump in the Night and I was determined to see this idea through to the end. The origin of this idea was a conversation with my wife and we were talking about strange incidents around sleeping having lived with her for over a decade and growing up in a family where multiple members had night terrors. Being more comfortable talking about the unique issues of others besides myself, I started commenting on the imaginary spiders and scorpions that my wife would see at night – yes this is foreshadowing of a future piece – and Jenny started talking about how frightening her episodes of sleep paralysis were. As she described emerging from sleep being fully awake and aware of her environment but unable to move, I became anxious. I recently discovered after all of these years that I am terrified of small confined spaces, but the idea of being confined in essentially the smallest space possible, ones own skin, caused my heart to beat faster and Jenny’s description really caused me to be a bit panicked. It didn’t take long for me to realize that this was abstractly the perfect idea for a piece. I started to put myself into my wife’s position, what would I do, how would I react to this imprisonment within my body? The end result speaks for itself and you have a glimpse into my own psyche that the reaction would manifest itself intensely to where I would be screaming at myself in frustration. 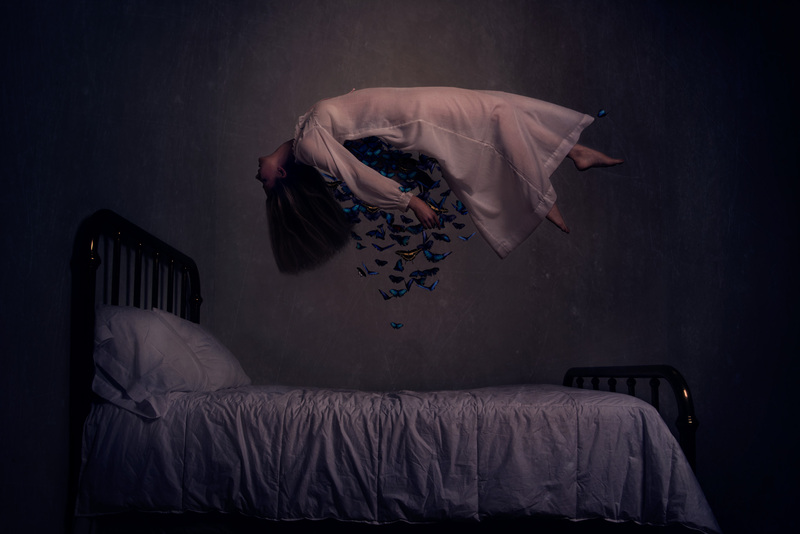 Things That Go Bump in the Night is a culmination of ideas of moments before, during and – as in this image – after sleep; they are images of whimsy and fear taking place in the most intimate setting in a home: the bedroom.